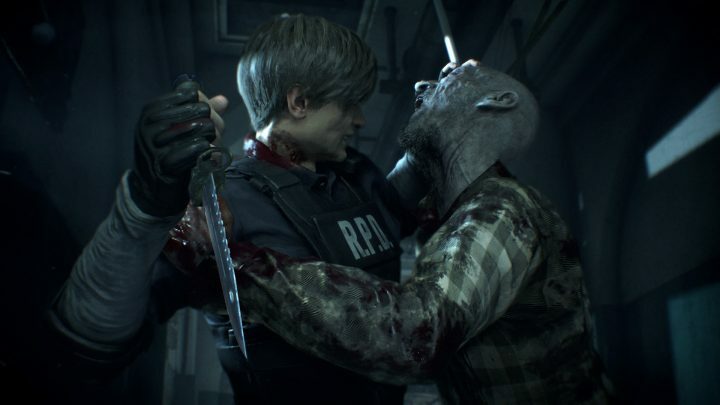 Resident Evil 2 Remake adds a whole bunch of unique weapons to both Claire and Leon’s arsenals, and if you want to get every weapon in this enhanced reimagining of the classic PS1 game, you’ll need to solve a few totally optional puzzles. The biggest puzzle is all about the Magnum (or, in Claire’s scenario, the MQ-11 SMG) — it’s an amazing weapon that’s also 100% optional, and very missable. If you don’t solve all the puzzles you need to solve before reaching a certain point in the story, you’ll lose access to some of the best weapons for each character. Below, you’ll find info for unlocking every single weapon. Some weapons can’t be missed, while others absolutely can. And that goes for more than just the Magnum / SMG. You can also unlock bonus, upgraded versions of your starter weapons when you replay each character’s B-Scenario. These are different Scenarios you can unlock by completing the standard stories. Those enhanced weapons come in handy. There are weapon upgrade parts you can find, too — we’ll go into greater detail on a separate locations guide. There are a variety of weapons Leon and Claire can collect in their respective stories. Leon and Claire will each find a unique weapon in their B Story — and each character will unlock different sets of weapons. The weapons always spawn in the same locations, but a different weapon will appear depending on the character story you’ve selected. W-870 Shotgun: 1F Safety Deposit Room – Use the Weapon Locker Keycard (2F Art Room) to unlock the weapon locker. Lightning Hawk Magnum: 2F STARS Office – Use the STARS Badge on the PC in the STARS Office. To get the STARS Badge, collect the Red Book (2F Library) and combine it with the Left Arm (2F Art Room), then attach it to the statue to get the Scepter. Examine the Scepter to get the Ruby, then insert the Ruby into the Bejeweled Box (1F Observation Room) to get the STARS Badge. Chemical Flamethrower: Lower Sewers, Supplies Storage Room – Open the King Plug door to collect. Anti-Tank Rocket Launcher: Dropped during Leon’s final boss battle. Can’t be missed. GM-79 Grenade Launcher: 1F Safety Deposit Room – Use the Weapon Locker Keycard (2F Art Room) to unlock the weapon locker. JMB HP3 Pistol: B1 Parking Garage – Use the Car Key (Firing Range) to attain. Examine the Yellow Box to open it and get the Car Key. Press the button on the broken key to unlock the police car trunk. MQ-11 SMG: 2F STARS Office – Use the STARS Badge on the PC in the STARS Office. Spark Shot: Lower Sewers, Supplies Storage Room – Open the King Plug door to collect. Minigun: Dropped during Claire’s final boss battle. Can’t be missed. M19 Pistol: Only available in Leon’s B-Scenario story. Found next to the item box, in the first room. Quickdraw Army Revolver: Only available in Claire’s B-Scenario story. Found next to the item box, in the first room. You’ll also be able to find special upgrade parts for many weapons. We’ll cover upgrades in a separate guide.